We offer chemical infusion therapy provided by a team of professionals here for you and your family. In addition to professional collaboration, we provide modern treatment with state of the art equipment. Our patients' comfort and well-being are our primary concern. We are proud of our beautiful facility with ten comfortable treatment areas overlooking the Serenity Garden. Comprehensive up to date Medical Oncology and Hematology services provided close to home in safe, friendly, beautiful, and comfortable surroundings. "Total Patient Care" is the goal of our entire healthcare team. Our team's emphasis is on health education, your emotional support, problem solving, and goal setting with you and your family as active participants in your treatment plan. Physician-Dr. James Commers - Dr. Commers received his medical degree from the University of Nebraska Medical Center College of Medicine (UNMC). He completed an internship and a residency in internal medicine at UNMC and completed a fellowship with the National Cancer Institute, Division of Cancer Treatment, Pediatric Oncology Branch, in Bethesda, MD. He is a fellow of the American College of Physicians and is board certified by the American Board of Medical Oncology and the American Board of Internal Medicine. 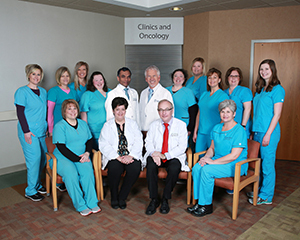 Physician-Dr. Robert Warner -Dr. Warner has been dedicated to caring for patients in southwest Iowa since 1987. Board certified in internal medicine and partner at Heartland Oncology & Hematology, he graduated from Creighton University School of Medicine. He completed a residency in internal medicine at the same university. He completed fellowships in oncology (the study of tumors) and hematology (the study of blood diseases) at the University of Massachusetts in Pittsfield, Massachusetts and the University of Nebraska Medical Center in Omaha. Trained Registered Nurses - Oncology nurses are on the front lines of chemotherapy delivery, providing education, side effect management, and emotional support to patients and their families. Licensed Social Worker - A social worker provides education regarding cancer issues, counseling and emotional support, helping to find community resources and support, and assistance with financial applications, medical forms, and advanced directives. Registered Dietitian - A registered dietitian provides nutritional guidance and helps identify diets that might maintain strength, improve tolerance to treatments, and decrease adverse side effects of treatment. Pharmacist - The onsite pharmacy staff prepares chemotherapy and treatment related medications. Nurse Practitioner - A nurse practitioner provides resources to implement survivorship care as part of the patient's comprehensive care plan. Facilitates coordination of care between oncology specialists and primary care providers. Survivorship care comprises the physical, psychological, emotional, social, spiritual and economic aspects of life that may be influenced by cancer at any time from diagnosis through treatment and all remaining years of life. For questions, call the MCMH Center for Oncology & Hematology today at (712) 623-7226! "Journeys" is a support group that provides a safe, supportive atmosphere to learn about and understand the grief process, to share grief experiences and to search for a renewed sense of meaning and purpose in life. Sessions are held on Wednesdays and starts at 6:30 p.m. and ends at 8:30 p.m. Minimum of four participants. Meetings will be held in the Conference Center in the lower level of the Montgomery County Memorial Hospital. There is a $15 registration fee for supplies. However, no one will be turned away due to an inability to pay. For more information, contact Christie Welter at (712)623-7288. MCMH also offers a cancer support group. Meetings are held the 4th Tuesday of each month at the MCMH Center for Oncology & Hematology. MCMH introduces "A Time to Heal" This is a support class for cancer survivors and their care givers. Since 2012 - I could have not received any better care and attention to my needs. Dr. Commers and his staff are the best. Very professional, very humble; exactly what I needed to fight through this battle, my comrades, right there for me along with my family and friends, reminding me always to keep my FIGHT ON!